I always find solo piano albums intriguing. 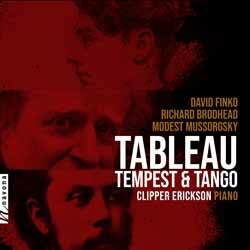 And Clipper Erickson's Tableau, Tempest & Tango is no exception. Obviously to capture the complexities of a full orchestra on a single instrument is impossible, but to give him his due, Erickson does a wonderful job of capturing the essence of each piece. Most will be familiar with Mussorgsky’s Pictures at an Exhibition, so if there are any flaws this is where you'll spot them. And to be honest, he does tend to stumble his way through sections of it... but then with a live recording you'll never get a smooth and polished performance as the pieces are too complex and cluttered for a solo piano to carry off a flawless interpretation. If you're a true fan of the piano as a solo instrument then what Erickson delivers here will warm your heart greatly.